To celebrate Unique Young Mum turning one today (2nd of August) I have a number of competitions coming your way, I now present you with the bronze competition. The bronze competition is a £5 Amazon voucher for one winner to win. After running a number of competitions, I am noticing some of you are NOT following the rules, to have your fair chance of winning please do read the requirements, simply writing a comment saying I'd love to win this is not what I have asked! Enter the competition via the Rafflecopter below. WIN: Back To School Items With Wilko! Unique Young Mum's New Design.. When The Rubbish Hits The Fan.. WIN: 1 Of 2 Pairs Of Bubble Shooz! WIN A WOW Toys Mix 'n' Fix Mike! 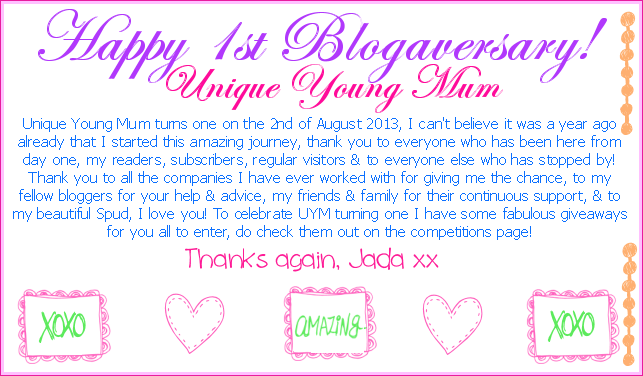 Happy Blogaversary Unique Young Mum!